Please see our RSVP link below. 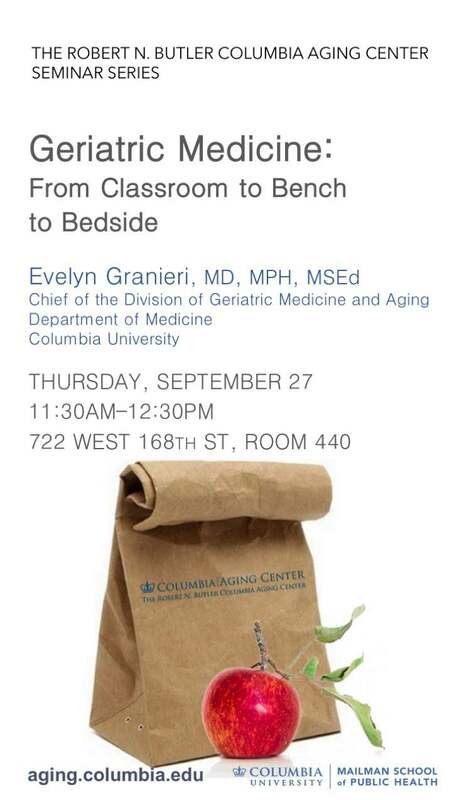 Please join us on Thursday, September 27, 11:30 a.m. (until 12:30 p.m.) for the seminar "Geriatric Medicine: From Classroom to Bench to Bedside" by Dr. Evelyn Granieri, Chief of Columbia's Division of Geriatric Medicine and Aging. The event takes place in Room 440, 4th floor, Allan Rosenfield Building, 722 W. 168th Street. To attend, RSVP to ColumbiaAgingCenter@cumc.columbia.edu.